Laurenziana Plut.89 Sup.35, Florence, is a miscellany manuscript written in Latin and Italian. The first pages contain a set of rough alchemical illustrations that appear to be derived from works like “Pretiosa Margarita Novella” by Janus Lacinius, “Aurora Consurgens” and “Rosarium Philosophorum”. 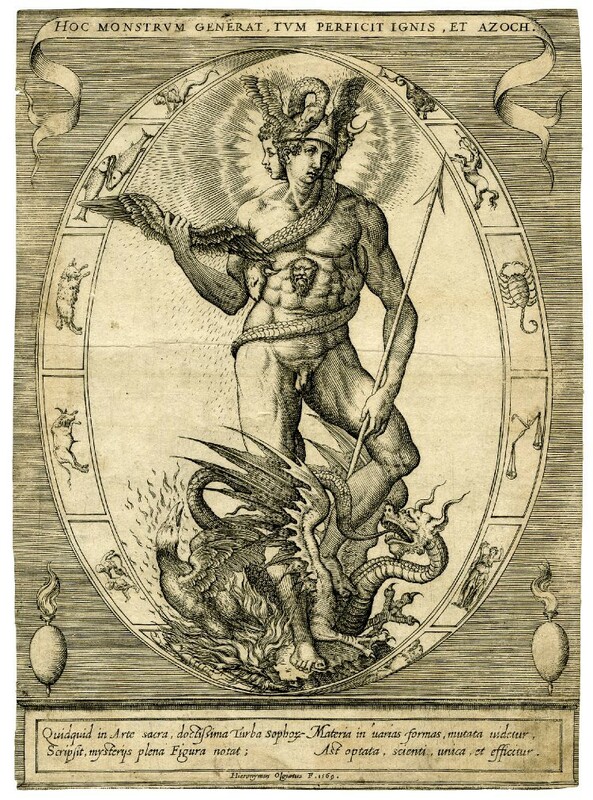 An alchemical engraving was pasted at f8v; it is accompanied by this quote: “Ascendens superius est sulphur albissimum quod accipere possunt Alchimisti / ut ex eo faciant argentum. Quod vero remanet inferius est sulphur rubi / cundissimum tinctum ut scarlatta, quod accipere possunt ut ex eo faciant / verum aurum. Hec Arnal[dus] de Villa Nova” (White sulphur rises to the top; it can be take by alchemists in order to make silver. What remains below is very red sulphur; they can take it and make true gold with it — Arnaldus de Villa Nova / Arnald of Villanova). 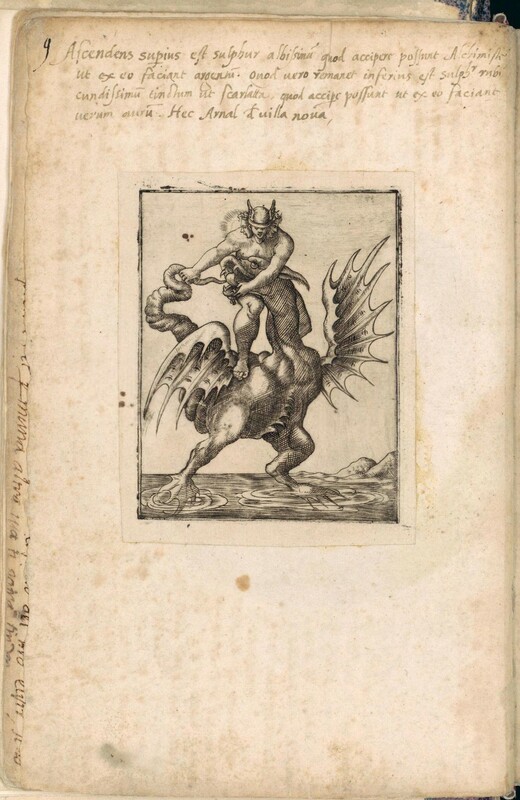 I have been unable to find the origin of the engraving in the Florentine manuscript, but the British Museum site features a similar work by Girolamo Olgiati (dated 1569). The site also hosts photographs of a letter in which Erwin Panofsky rejects an astrological interpretation of the engraving, correctly interpreting it as an alchemical allegory. He also points out that Olgiati was inspired by the 2nd Century CE Aion/Phanes relief at Modena. The engraving in the Florence manuscript appears to be related with (and probably derived from) Olgiati’s allegory: the most telling details are the three faces corresponding to the Sun, Hermes and the Moon (i.e. Gold, Mercury and Silver) and the posture of the dragon / ouroboros. Hence, one can assume that much of Panofsky’s analysis can also be applied to the engraving in Plutei 89 Sup. 35. Kindly forgive my being late in acknowledging your letter imparting to me the astrological analysis of your picture. I don’t think that this analysis has any value whatever, because (as stated in my letter to Mrs. V. Pokorny) the main figure of the composition has nothing to do with Mercury in the sense of a mythological or planetarian divinity, but is basically a cosmological allegory, meant to embody the manifold structure of the Universe, changeable as it is, thanks to the power of time. On the other hand, I am glad to inform you that I am now able to offer a plausible solution of the more specific problem involved. As pointed out in my letter to Mrs. V. Pokorny, the hexameters beginning “Quiquid in arte sacra…” may be translated as follows: “This mysterious figure denotes what was written by the crowd of wise men, most experienced in the sacred art, namely that matter is changeable in many ways, but can be unified in accordance with the wishes of the Initiated”. Now it struck me that the expression “Turba Sophorum” (the crowd of wise men) is also the title of a very famous treatise on Alchemy, translated from the Arabic (“Turba Philosophorum”, printed Strassburg 1622 and 1613, furthermore Basle 1610 under the title “Artis auriferae, quam Chemiam vocant, volumina due, quae continent Turbam Philosophorum”). Thus I ventured the conjecture that the picture might bear upon this “science” which, in point of fact, was called “Ars sacra” in those days and was so much in vogue during the 16th and 17th centuries. This conjecture proved true and affords a satisfactory explanation of the whole thing. 1) The relation to Alchemy is confirmed by the two vases belching fire; there is also a Dürer drawing (Lippmann 456) representing an alchemist which exhibits a similar motif, and many other instances can be adduced. 2) The word “Azoch” in the upper inscription reading “Hoc monstrum generat, tum perficit ignis et Azoch” is a technical term of Alchemy, meaning quicksilver or mercury in the purely chemical sense of the word. Thus this line is to be translated: “This monster brings forth, then fire and quicksilver do the perfecting”. Now it was a favourite belief of the alchemists that quicksilver was the very substratum of the “Philosopher’s Stone”, and the united action of quicksilver and fire (“ignis et Azoch”) was believed to perform the decisive operation on the “raw or impure matter”, called “Laton” in the alchemistic slang. In an ancient special dictionary of this curious language (Ruland, Lexicon Cymicum, 1612) we find the following statements: “Azoch is quicksilver, the substratum of the Philosopher’s Stone. Therefore it is said that Azoch and fire are sufficient to blanch the Laton”, and: “Laton means the raw or impure matter. If it is not blanched, it is no use, but if it brightens, it changes into gold”. Thus the meaning of the line “Hoc monstrum…” is as clear as an alchemistic sentence can be expected to be: This monster (that is to say, the creative power of the Universe) produces (viz matter, changeable in many ways); then Fire and Quicksilver perfect it, or finish the operation (that is to say, transform blanching or brightening the raw material). 3) The “Turba Philosophorum” is, in point of fact, essentially based on the theory expounded in the hexameters “Quicquid in arte sacra…”, namely on the idea that matter in general, and the Philosopher’s Stone in particular, is changeable, and still a unity. In the Basle edition quoted above, we find for instance such statements as the following (p.106): “In fact, it is one thing in which all elements are contained, water, soul, oil, quicksilver and gold, fire, the Eagle, tears and the whole raw material of the perfect body”. 4) Even the eagle and the dragon, on which the main figure stands, could be invested with an alchemistical meaning, for the Dragon means again quicksilver, and the Eagle means the “Spirit” or “Precipitate” of quicksilver (according to Ruland’s dictionary). To sum it up: the curious late-antique figure of Phanes, as rendered in the Modena relief (cf. my book “Hercules am Scheidewege”, Plate V, 8) which in the Weimar drawing (Plate V, 9) had been interpreted as a personification of the “Year” (cf. the inscription reproduced on p.9 of my book), was the subject to an even more arbitrary interpretation, when the visual data were considered from the view-point of Alchemy, as is indubitably the case both in your picture and the Olgiati-engraving. The whole composition can now be called an intricate and rather cryptic, still not inexplicable “ALLEGORY OF ALCHEMY”, the fundamental principles of this science being expounded in the inscriptions, while the two vases are meant to be a kind of emblem of the “Sacred Art”. I am sorry that this analysis has led us into a sphere even more remote than that of astrology, but this solution has the advantage of being based on authentic contemporary sources and of being confirmed by the term “Azoch” which is an undeniable proof of the fact that the whole thing bears upon Alchemy.